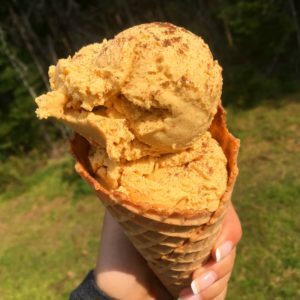 This year we’ve brought back all of the pumpkin flavoured favourites with a new vegan twist on the Pumpkin Gelato! Made with pumpkin puree, coconut milk, and chai masala spices. Bonus points if you get your scoops on one of our vegan waffle cones! Made with pumpkin spice, espresso, topped with whipped cream and dusted with nutmeg. 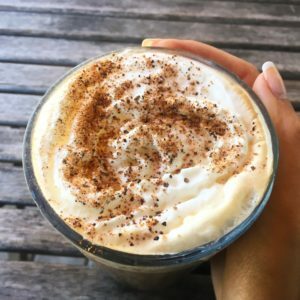 Ask us to make the latte with soy or almond milk, and without the whipped cream for a vegan alternative. 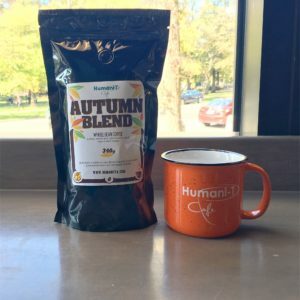 Our Autumn Blend is exclusively available at both of our locations! This blend is dark, fruity, and chocolatey with a spicy finish. Perfect to cozy up with in one of our orange campfire mugs!